The collect and readings for the Second Sunday after Epiphany may be found here. The following sermon is based on John 1:43-51. “Can anything good come out of Nazareth?” Nathanael has some opinions, some assumptions, about Nazareth. You ever make any assumptions? People of faith, people like Nathanael, people like you and me, make these and all sorts of other assumptions everyday. Sometimes our assumptions are about other people; how they will behave, what they will say, what we can expect, what they think or believe. Other times we look at particular situations, our marriage, the state of the middle east or the church, a teenager trying to grow up and we declare it hopeless. We are sure nothing good can come out of that situation. Then there are those times we look at our selves or a part of our life; maybe it is a secret we have carried for years, the illness we face each day, the addiction we hide, the hurts we have caused other, the loneliness and lostness of grief, and we say it will never get any better. How can anything good come out of this? We may or may not speak our assumptions out loud but they rattle through our heads and influence what we do. You know what happens we when we assume, right? The old saying has some truth to it but I am thinking of something else. The assumptions we make destroy relationships, love, and life. We think we know more than really do. Assumptions act as limitations. They narrow our vision. They close off the possibility of change and growth. Our assumptions deny the possibility of reconciliation, healing, a different way of being, or a new life. Ultimately, they impoverish our faith and proclaim there is no room for God to show up and act. 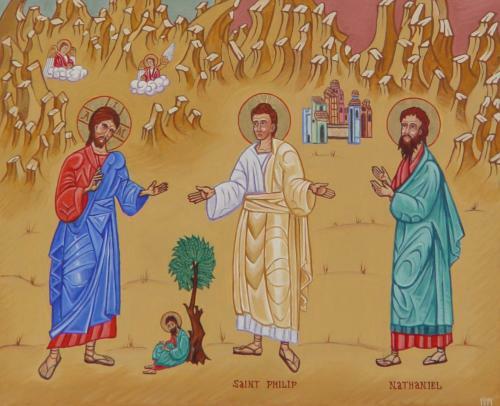 It is no coincidence that Nathanael is sitting under the fig tree when he makes his comment. It is the fig tree that gave Adam and Eve the leaves behind which they hid from God and themselves. It is the fig tree that Jesus will later curse for producing no fruit, no signs of life. Assumptions become our hiding places. They are not fruitful. They keep us from engaging life, ourselves, each other, and God at a deeper level. Nathanael doesn’t doubt that God will fulfill the Old Testament promises. He isn’t surprised by and doesn’t even question that Philip could have found the one about “whom Moses in the law and the prophets spoke.” His shock and disbelief are that this could come out of Nazareth. Nathanael has as much faith as the next guy, but Nazareth? No way. Not there. Can anything good come out of Nazareth? We all have our Nazareths. We think they are about other people, particular circumstances, or even pieces of our lives. Mostly, though, our assumptions are about us; our fears, our prejudices, our guilt, our losses, our wounds. We take our past experiences, real or imagined, and project them onto another person or situation. Assumptions keep life shallow and superficial. If we assume, then we do not have to risk a deeper knowing and being known. At the deepest level our Nazareths are about our understanding of God. We just can’t see how anything good can come out of Nazareth. We cannot believe that God could be present, active, and revealed in Nazareth whether it be another person, a relationship or situation, or our own life. It’s so hard to see life in the midst of death, hope in places of despair, and the good and beautiful in what looks like the bad and ugly. It’s sometimes easier to assume. For us Nazareth is a blind spot. For God, however, Nazareth is the place of God’s manifestation and self-revelation. It just seems so unGod-like to show up in Nazareth. Whether it is the town, a person, or a situation, Nazareth is too common and ordinary, even mundane. Shouldn’t the person or place of God’s coming be more deserving, special, acceptable, holy, better behaved, likable, more regular at church, someone who prays more, better dressed? The Nathanael in us has a particular set of conditions or prerequisites that must be met before God will appear and act. That says more about us than it does about God. God does not allow himself to be limited by our assumptions. For every Nazareth there is an invitation to “come and see.” For every assumption we make there is a deeper truth to be discovered, a new relationship to be experienced, and a new life to be lived. Our Nazareths become the place of God’s epiphany. Over and over Jesus shows up from the Nazareths of our life and calls us out from under the fig tree. Whenever we leave the fig tree we open ourselves to see God present and at work in the most unexpected places and people. As the assumptions fall a new life and a new world arise. The fulfillment of God’s promises and earthly life happen in Nazareth. The last place we would have thought that possible is the first place God chooses. Come and see. Our salvation and healing happen where we thought nothing good could happen. Reconciliation and love are revealed in relationships we were certain nothing good could come from. The seemingly hopeless situations of life begin to bear fruit. Words of forgiveness and compassion are spoken by people we were sure could never say such things. God puts lives back together in Nazareth. There is more happening in Nazareth than we ever thought possible. You see, not just “anything good” comes out of Nazareth. The One who is Good comes out of Nazareth. Previous Previous post: In Whose Name Shall I Baptize You?